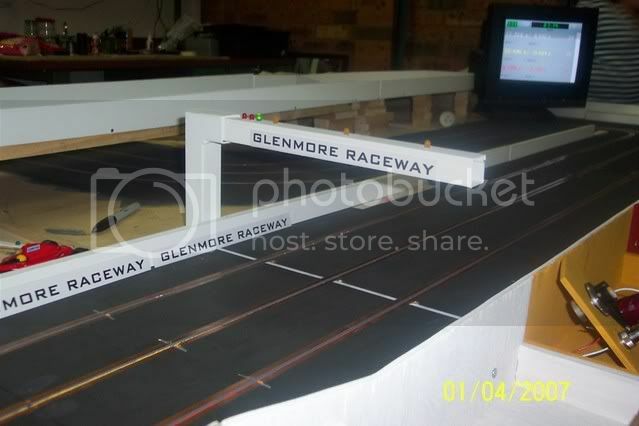 The last update I had on my three lane routered layout was on ANZAC day. So, a brief summary. This is where I was up to at the time. 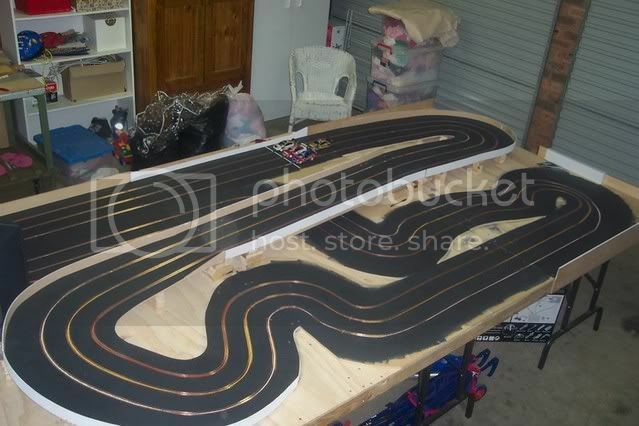 The track was all built, painted (low sheen interior paint) and was 2/3's taped (I'm using copper tape). In September I got it running. Big gap in progress, but we had a new addition to the family. I got the timing hooked up, running Ultimate Racer 3 using darlington phototransistors for the sensors and for the time being, a desk lamp for the light source. The lane layout is 1 white, 2 yellow and 3 red. On 9.5v I had the V8's down to 8.9 in white, 8.95 yellow and 8.9 in red. I got a Ninco Supra down to 8.2, 8.1 and 8.5. Now I'm not the greatest trigger operator going around, but over a block of 20 laps, I could consistently hover about .05 to .1 of a second from these times. The problem I was having, was that I found them all to taily. 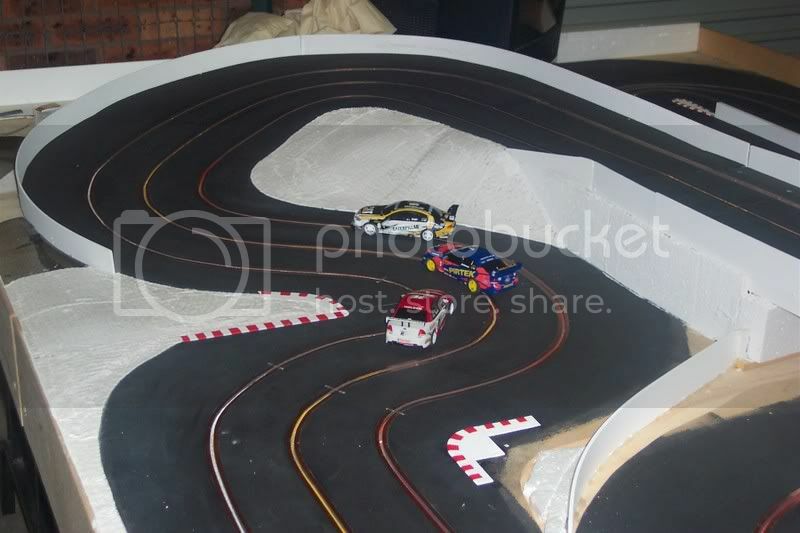 The cars wouldn't hold a nice drift through a corner, there was basically just no grip at all so would almost 'pendulum' its way through the corner if I was a little too hot going in. Even down the straights on 9.5v you tell they were struggling to grip onto the surface. So over the last couple of weeks I'd been toying with the idea of re surfacing. I'd read a heap of threads here and abroad about different paints and their differing grip levels. 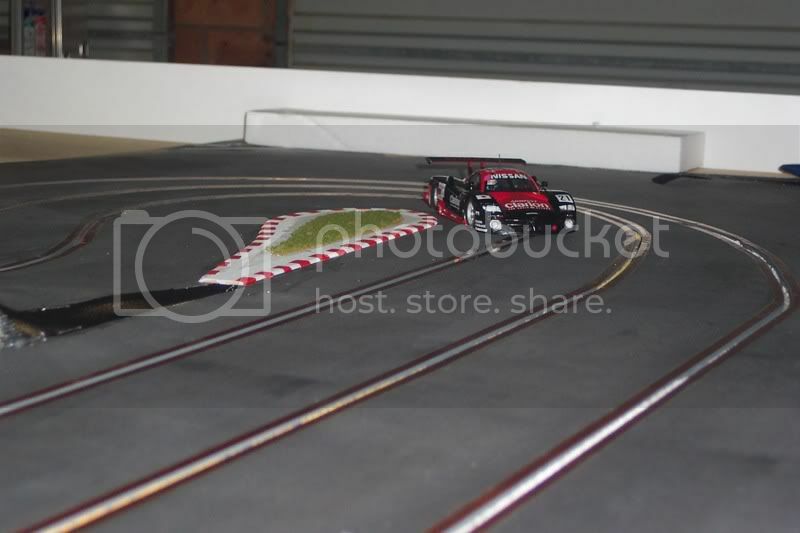 Having raced on Boslot's ferrodor track numerous times, while the grip level was great re routing the entire track to enable braid, plus the cost of braid was most definitely out of the question. The easiest and cheapest was chalkboard paint. I bit the bullet on the weekend gone and spent a day masking, trimming and painting. I didn't get pics of it in progress, just the completed rework. I only rolled a single coat on straight over the top, just cleaned the surface with an Enjo glove! 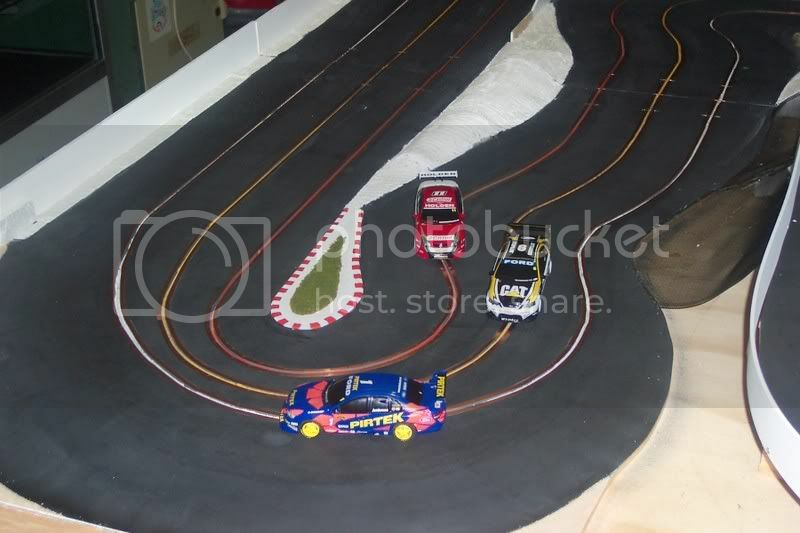 Front straight, start where cars are. Turn one. Could be nasty at the start of a race, esp with only a short run from the start. Will find out when I eventually have the guys over! The bridge. Where the 888 Falcon and Castrol Commo are, are removable sections which join the tables together. Underneath the centre table. Each table has it's own terminal strip, and then it all feeds to a 9 pin plug. Sine the repaint, still on 9.5v I have gotten V8's down to 7.3 white, 7.3 yellow and 7.2 red. The Ninco Supra I've only run on yellow and that was a best of 6.9. Today I got a Scaley Ferrari F2004 so I removed magnet, added a bit of weight, and on yellow I managed a couple of 6.6's. Edited by gazza, 24 May 2009 - 06:52 PM. Nice layout. Routed tracks are always my favourite. What do you have in mind for scenery? Good work Schuey on the track. 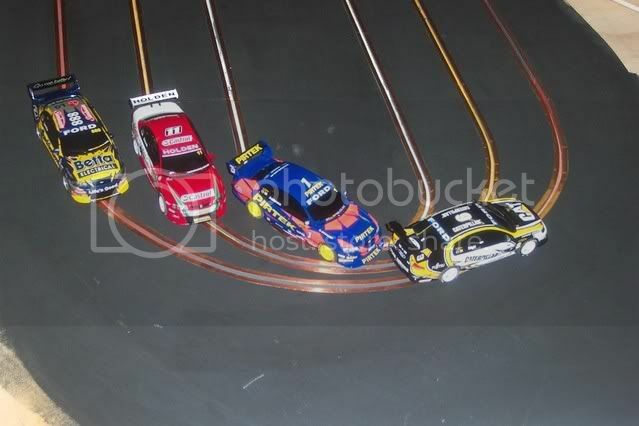 Did you run ninco cars with older style softer tyres with wd40 on the tyres to get some rubber down ? Always works well for us up here. Good work Mick, Good to see it's coming along. Excellent work Michael. Good to see some thought outside the box on the surface finish. Just keep pecking away and that will be an excellent track. Looking Good Mick. It would probably be good if people stopped breaking the 888 car though. 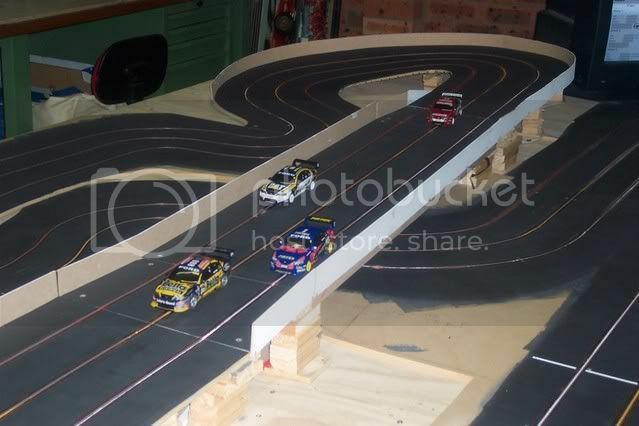 Am looking at 3 DTM cars one of each of the 3 manufacturers from before Opals pull out. I will keep you a breast of where I'm at as I go along. Ron, welcome aboard. Like I said the other day a big difference with the new surface. Yeah, but mother in law felt so sick about her guests breaking it, that's how I ended up with the Cat Falcon! Martin, didn't know about that tip! Oh well. Now that I've run it a bit, it doesn't have the viscous bite as it did when first done. So now there is a little hint of drift, but not the insane amount of before. 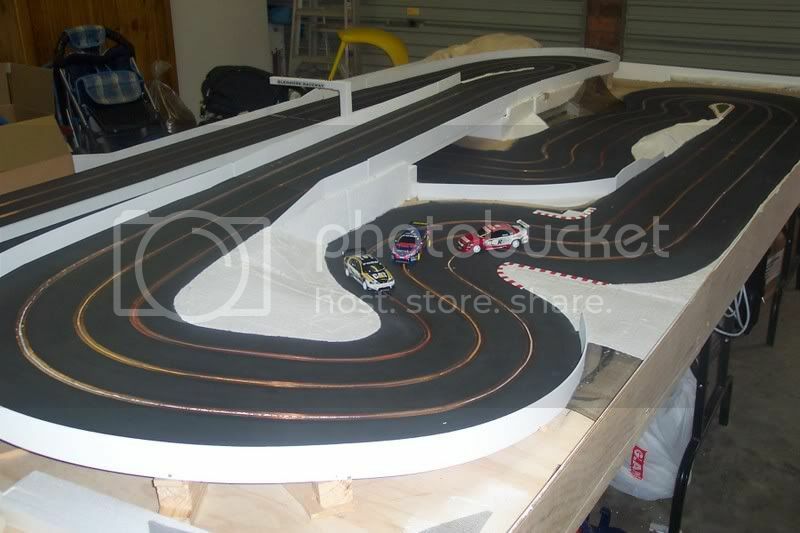 Nice track, wish my routed track track looked like that. A bit of an update to my track. Finished the light gantry a month or so ago. Used a piece of 16mmx16mm electrical trunking with removable top. This fitted perfectly into a 's' piece I got a mate at work to make for me from square sectional tubing or what ever its called. 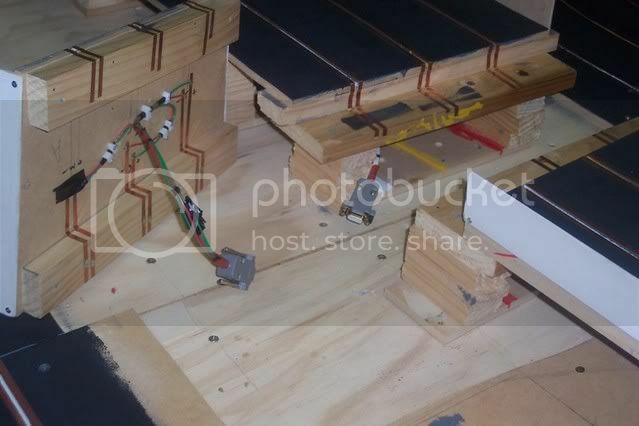 The three IR LEDs for the light source in the bottom are powered off an adjustable power supply set at four volts. 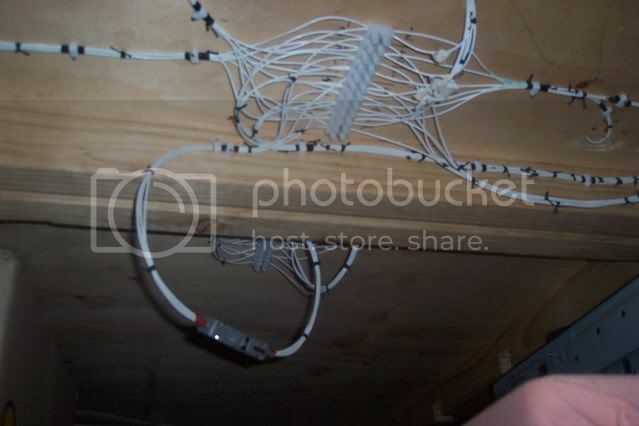 The LEDs on top via a seven pin plug connect to the sensor harness which goes to the PC. The three orange LEDs are lane indicators which, software dependant, can be used to indicate when a driver does fastest lap, jump start, low fuel... you get the idea. Also made a start on the scenery. Here is the first pic. 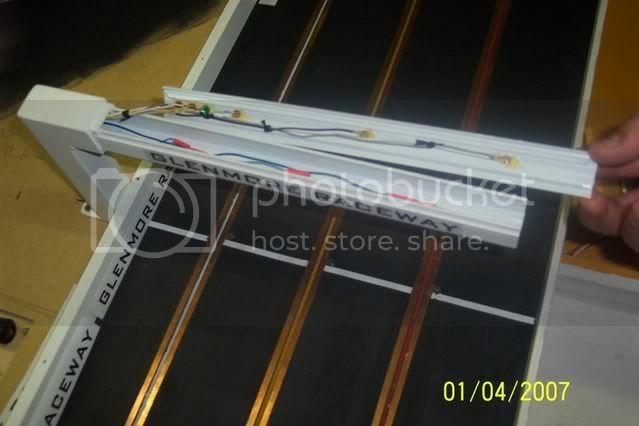 The ripple strips are from 2mm balsa. All scenery material is woodland scenics. Since this pic was taken last week, I've done a heap more, just haven't taken pictures. We had some friends down from QLD visit yesterday, and I drove it for the first time with scenery in place. One of the hills that I had plastered was abit too close and there was a tendency to lift the back of the Slot-it Nissan. It is a longish car, but I though I would do that part again anyway. Pics to follow. Starting to look good. How is the Ultimate Racer 3 software performing? Am finding UR 3.25 excellent. Had some small probs earlier, mainly the start lights not staying on when the session starts. When I installed v2.5 that went away, but now I can't seem to get the fast lap light to come on when it should, ie when a fastest lap is done. They work fine when a jump start is made so I know the lights work, and I have triple checked the settings. Anyway, not too fussed about it. Here are some pics that I've taken today. So far all I've done is ripple strips, walls and to plaster hills and some parts of the trackside. I want to have that all done first before I start painting. Good job so far Michael, looks like it is worth taking your time on it as it is coming along great. 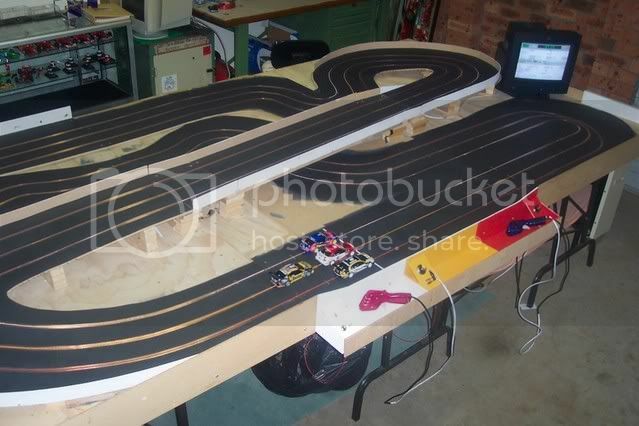 Can I ask you what type of plaster product you used on the track? I'm assuming from a hardware? Lookslike woodland scenics plaster cloth to me. Nice work Sch, the thing will come to life once you add some colour to it. schuey19 thanks for the feed back about the software. Jamie, I started building this way back in Dec 05, so yeah you could say I'm taking my time, especially when we've seen what Bo and Charlie get up to in a couple of days! But since I've started the scenery, I'm spending about two hours a night out there. Manic, like Martin said, it is Woodland Scenics pre-plastered cloth. Just cut to required shape, sit in water for a minute or so and apply. I've got the next week off work, so in between playing with the kids, studying for a work related promotion board and general round the house jobs, I'm aiming to have at least the all the plastering done. And to finally finish the drivers stations. 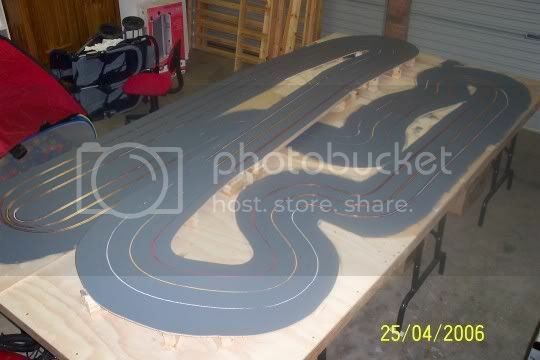 And I thought I was slow building my new track! We've moved house and had a baby in that time. 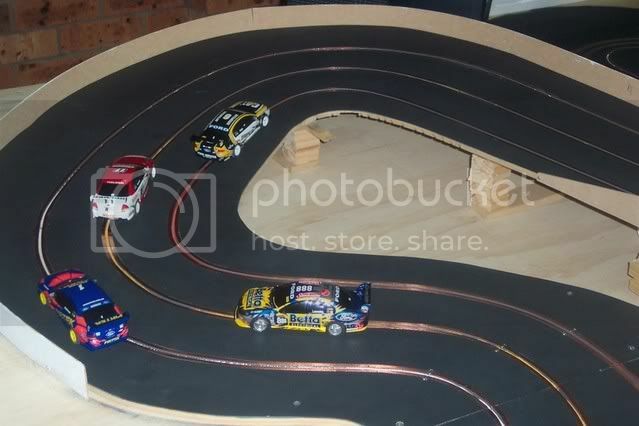 And I'm on a very limited hobby budget which has to include cars, and when we have 12 classes that we run, its a toss up between cars or materials. Edited by schuey19, 29 April 2007 - 04:03 PM.